Over the past few months, I’ve written a number of articles about one of the most useful flight search tools on the internet, ITA Matrix. However it has one key flaw, it’s not possible to book tickets directly with what you find on the site. There are a few workarounds which I’m going to explore in today’s article. This is definitely at the geekier end of what I normally write about, however I’ll do my best to keep it as straight forward as I can. The first one is the most low-tech, but just print off the summary screen and give it to a travel agent, either by email or in person. If you want to travel at short notice, then there is a risk that availability may change between the travel agent seeing the itinerary and either pricing it or ticketing. It’s definitely one for less time sensitive bookings. Flyertalk is a pretty useful website and some people from the community have clubbed together to write bunch of scripts that enhance the functionality of ITA Matrix. There’s a long wiki post, with full details here. I personally have installed a Script Manager (Tampermonkey) and have them installed as a UserScript so whenever I visit the site. This may be a security risk if you’re not confident with what you’re doing. Please also do take time read through the full FAQ on the wiki post. You’ll know it’s running as you’ll see an extra bar at the top of the website. Clicking on it, gives you a whole bunch of selectable options. In addition, if you click on the TamperMonkey icon in the menu bar, you can turn the scripts on and off. Now that it’s installed, it really comes into it’s own on the final itinerary details page; there’s quite a lot of extra information provided. For example, there’s a full mileage breakdown, under the flights list, which can be useful for calculating mileage earnings. In addition to the right of the “How to buy this ticket” box, there’s a long list of booking links. Clicking these will attempt to pass the details of the itinerary over to the booking sites listed. 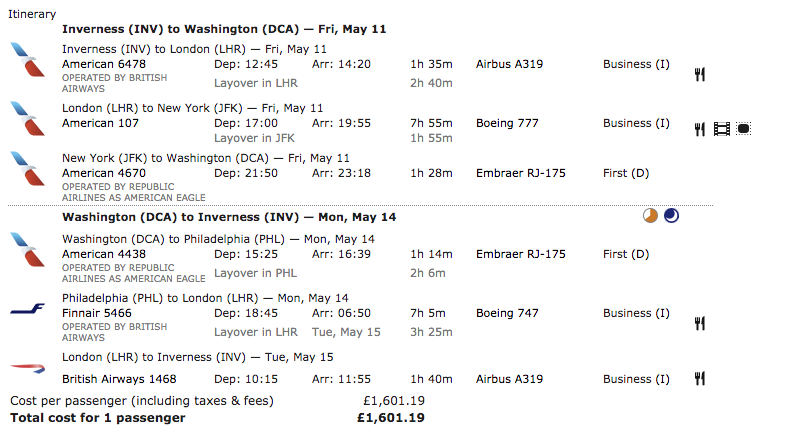 For example, I’ve priced up the following itinerary from Inverness to Washington D.C. as an example. Clicking the “Use American” link, takes this booking through to the American Airlines website, with the same price (albeit in US dollars) as the itinerary that ITA Matrix has priced up. I can enter in all of my details and proceed through to the payment pages to confirm the series of flights. These links don’t always work for the very complex itineraries, or ones that include more unusual airlines. The one I’ve outlined above is relatively straight-forward, even though it does contain a number of segments with codeshares. It’s worth trying a number of the booking links to see if one will pass through the booking engine correctly. For example, if you are searching for flights with Lufthansa and click the link to book via the American Airlines website, it won’t be able to book it for you and will give you an error page. 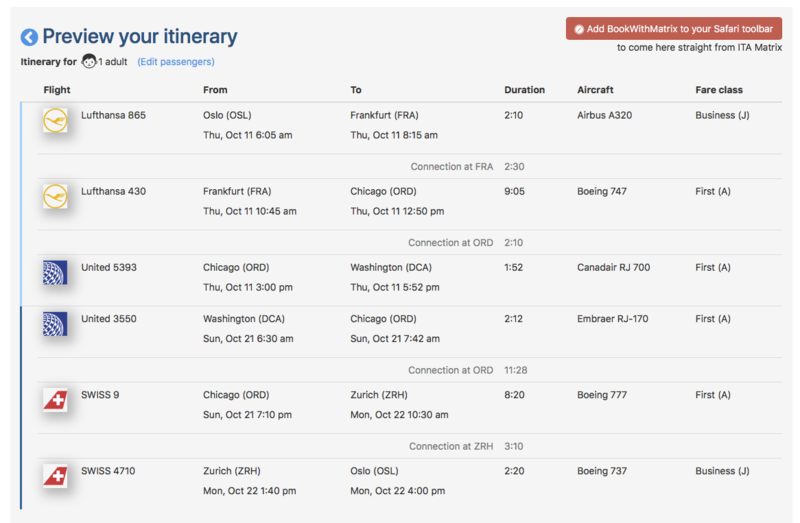 However even if you click the link to the Lufthansa website, it might not show you the exact itinerary you’ve found. Keep trying, one of the links should work! The final option is a website called BookwithMatrix.com which does pretty much exactly what is says on the tin. It’s a matter of doing a select all from the final itinerary page on the ITA Matrix site, copying the text, and then pasting it into the text box on the website. NB, If you have the ITA Matrix Powertools scripts, you’ll need to turn them off, before copying and pasting the text. 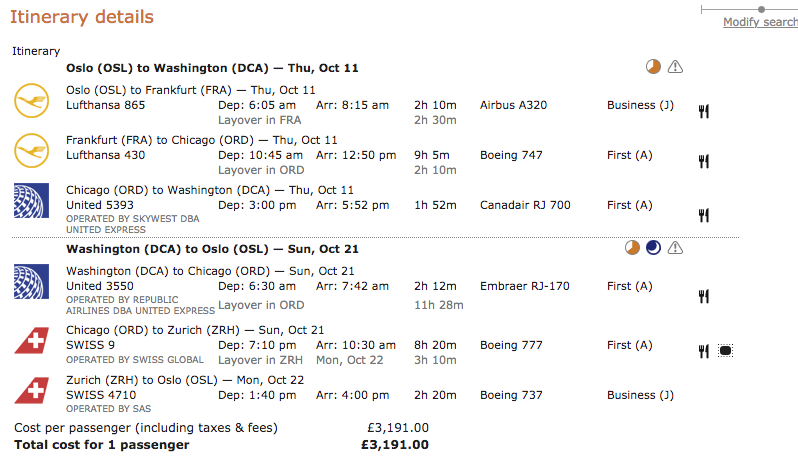 For example, I’ve priced this itinerary from Oslo to Washington with Lufthansa and Swiss. Pasting it into the BookwithMatrix site and it should parse the details to give me an exact replica, which it will then send off to a bunch of travel agent sites in a similar way that the Powertools do. From an internet perspective, I’m not endorsing these sites, I’m pointing out that they exist and can help. I strongly suspect that they have a bunch of affiliate links to various travel agents and will earn a cut of the bookings; that’s entrepreneurship online for you. 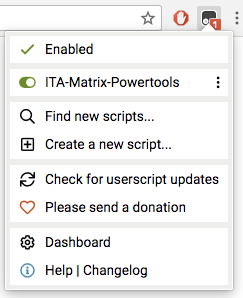 Personally speaking, I’ve had the ITA Matrix Powertools installed in Chrome for a while now and not had any issues with them. 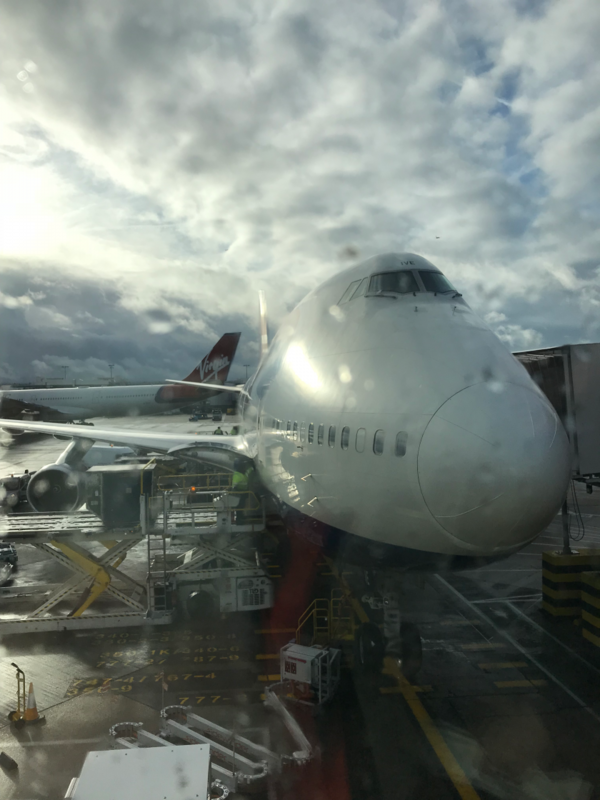 Previous Post: Virgin Atlantic Upper Class. £1,060 London to the US. Outstanding Deal. Next Post: Europe to Orlando in business. £1,000rtn during the summer peak with SkyTeam.